As part of a quest to find her Seattle ramen home, our writer tests two new ramen shops, Menya Musashi Niten Ichiryu on Capitol Hill and Engimono Ramen in Northgate. How did the tonkotsu and the tonkatsu stack up? There’s a bowl of ramen I dream about sometimes. This bowl is a steaming well of deliciousness with thin noodles cooked to the perfect texture of bouncy and soft, sitting in a bath of rich, silky tonkotsu broth that warms, enriches and comforts from the inside out with every divine spoonful. Although you’re consumed by the urge to gulp, you force yourself to sip and savor the different layers of this nuanced concoction. The fried garlic chips add crunch and yet another note to the broth. So do the scallions, red pickled ginger and sprinkling of sesame seeds. The cha siu — sliced pork belly — is perfectly cooked, firm enough that you can pick it up with your chopsticks but soft enough that its structure dissolves in your mouth. This, my friends, is the Hakata tonkotsu ramen ($8) at Izakaya Masa, a gem of a ramen shop in the Mission Hills neighborhood of sunny San Diego. It was my favorite meal on Earth during the three years that I lived there, and since moving to Seattle three years ago, I’ve compulsively searched this city to find anything like it. Every time a new ramen shop pops up, I run out to try it with an open mind and eager heart. Two new contenders recently opened: Menya Musashi Niten Ichiryu on Capitol Hill last November and Engimono Ramen in Northgate last June. Powered by my well of eternal optimism, I recently sampled both, hoping to find my new Seattle ramen home. Menya seemed the more promising of the two. It’s a branch of a Japan-based chain that has expanded to seven other countries, and the ramen photos on its website made me salivate. The second word in Menya’s very long name is a nod to Miyamoto Musashi, a warrior who founded the two-sword style of Japanese swordsmanship. 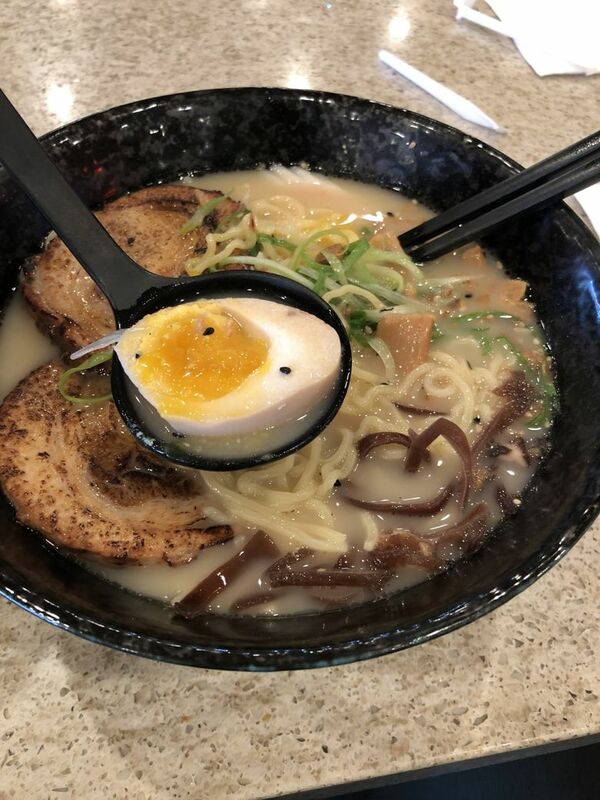 Menya also specializes in two things: ramen and tonkatsu (fried pork cutlets, not to be confused with “tonkotsu,” a pork-based style of ramen broth). This, I thought, could be the one! But my optimism dissolved the instant I spooned the broth from the signature Musashi Ramen bowl ($13.75) into my mouth. Menya’s broth, according to Seattle branch owner Tapsuya Oshima, is a fish-and-pork based concoction that cooks for almost 12 hours daily. My opinion? It passes the eyeball test — looks delectable and creamy — but not the taste test. The broth tasted disconcertingly, overwhelmingly, of bamboo shoots, without much other nuance, and had very little aroma. The tonkatsu pork cutlet that’s allegedly the co-star of Menya’s ramen bowl wasn’t much to write home about, though. It’s greasier than I prefer, and the breading doesn’t have much flavor — though the sweet-and-sour dipping sauce does improve things. I was also puzzled by the presence of what Menya calls its “fruit vinegar” on each table. It’s pretty — berries suspended in clear vinegar solution peek through the glass — but what, exactly, are you supposed to do with it? Trickle it into your soup toward the end, apparently. It did nothing for me. And neither did the other condiment at the table: little sticky pot of fried garlic, onions and chili pepper. Underwhelmed by my Menya experience, I wandered up to Engimono Ramen, located in the same building as the Northgate Target, at the corner of Northgate Way and Third Avenue Northeast. If it looks like a Chinese buffet restaurant, that’s because it occupies the space previously taken up by Northgate Buffet. The buffet counters are still there, as are the red Chinese screens. The menu, however, is entirely Japanese. 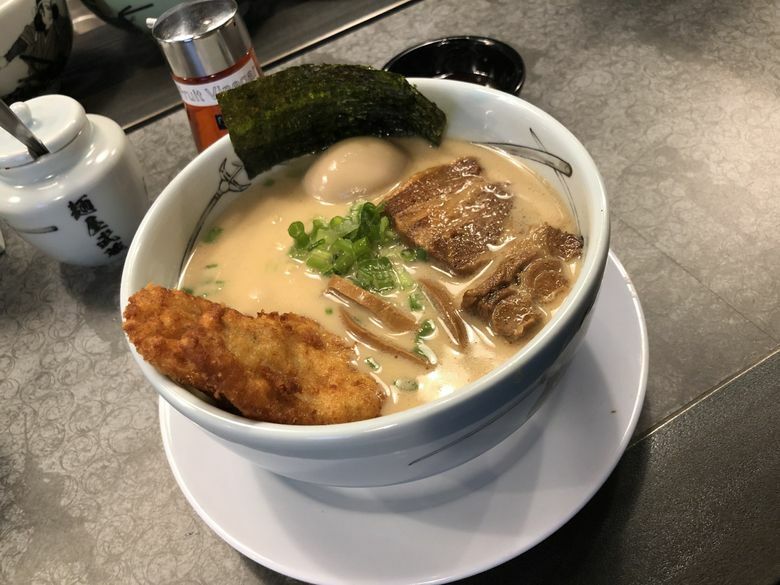 Ramen is the specialty, but they have a wider array of options than most ramen places, and for an extra $2, you can even get your ramen with gluten-free vegan noodles. Manager Ben Chen says the most popular items are the spicy tan tan ramen ($11.50), tonkotsu miso ($11) and curry ramen ($11). According to Chen, people also “rave” about Engimono’s curry bowls ($9.50-$11.50). Hoping to compare apples-to-apples, I stuck with the ol’ staple: tonkotsu shio ramen ($10.50). It wasn’t bad, with an overall pleasantly salty, porky flavor. But even though Chen says the pork-based broth cooks for 10 to 12 hours daily, I found it too thin. The marinated soy-sauce egg rivaled Menya’s, and the cha siu had an appetizing caramelized brown tinge, but the flavor was on the wrong side of burned. Verdict: Menya’s delectable pork belly makes the trip worthwhile if that’s your favorite component in a ramen bowl, while Engimono is a good lunch option if you get hungry while shopping at Target. Another option: Head to Ooink, on Capitol Hill, which gets my vote for best ramen in Seattle so far — though it should be noted that they don’t serve a traditional tonkotsu ramen. Instead, they’ve put a notable, unique spin on the dish that’s worth every penny. Meanwhile, my quest for the perfect Seattle ramen shop will continue. Menya Musashi Niten Ichiryu, 1510 Belmont Ave., Seattle. Tuesday-Saturday 11:30 a.m.-2:30 p.m., 5:30-9 p.m.; Sunday 11:30 a.m.-2:30 p.m., 5:30 p.m.-9 p.m.
Engimono Ramen, 300 N.E. Northgate Way, Seattle. Sunday-Thursday 11 a.m.-10 p.m., Friday and Saturday 11 a.m.-11 p.m.
Izakaya Masa, 928 Fort Stockton Drive, San Diego. Tuesday-Sunday 6 p.m.-1 a.m.